Facing untimely resignations, an unpopular war and a troubling 2008 election landscape, Senate Republicans didn't need another headache this week. The Idaho Republican's decision gives his GOP colleagues two unpleasant choices. They can resume pressuring him to leave, and risk being seen as disloyal politicians who go harder on alleged homosexual misdeeds than on heterosexual wrongdoings. Or they can basically ignore him for months, and endure more TV comics' taunts about a conservative senator convicted in a case involving public bathroom stalls. Judging from comments in the first hours after Craig's announcement, Republican senators were unsure exactly where to land. Outright confrontation with Craig, however, seems unlikely. Craig's lawyer Stanley Brand said the Senate traditionally has shied away from disciplining members for misdemeanors unrelated to their duties and might be unwise to cross that line now. "Are they going to begin to take up misdemeanor cases as a matter of course?" Brand said Friday on NBC's "Today" show. "That's going to put a lot of other people in serious jeopardy down the road." Five weeks ago, Craig announced his intent to resign Sept. 30 if he could not have his guilty plea rescinded. But Craig, who bridled at colleagues' not-so-subtle hints to leave, reneged on the deal Thursday. "Senator Craig gave us his word" that he would resign by Sept. 30 if he could not overturn the guilty plea, said Sen. John Ensign, R-Nev., who chairs the GOP campaign committee overseeing next year's Senate elections. "I wish he would stick to his word." "It's embarrassing for the Senate, it's embarrassing for his party," Ensign said. Asked if Craig's staying would be a distraction for the party, Ensign said: "It may be a personal distraction for me." "I would hope that he would live up to what he said he would do - not put the Senate through the wringer on this, respect the institution," Coleman said. "Clearly, his ability to serve his people was severely compromised." Some Republicans feel that Senate Minority Leader Mitch McConnell, R-Ky., went too far in late August when he called Craig's actions that led to his arrest "unforgivable." Commentators and activist groups contrasted the reaction to the welcome that GOP leaders gave Sen. David Vitter, D-La., after he apologized for his phone number turning up in a list of clients for an alleged call-girl operation. Craig, 62, was arrested June 11 in a men's room in the Minneapolis airport by an undercover officer. The officer said Craig exhibited behavior consistent with seeking a sexual encounter. But in Minnesota on Thursday, Hennepin County Judge Charles Porter ruled: "Because the defendant's plea was accurate, voluntary and intelligent, and because the conviction is supported by the evidence ... the defendant's motion to withdraw his guilty plea is denied." "I don't think it reflects on the party at all," Specter said. 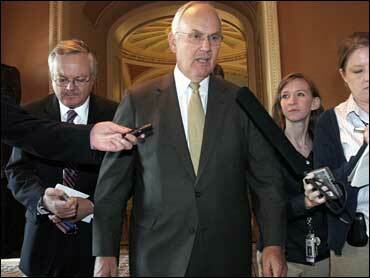 "Larry Craig is an individual. He doesn't represent the party or any other individual senator or any Republican. The conduct which is described here at worst is disorderly conduct. I don't know what his sexual preference is. It's not relevant to the issue in any respect." Meanwhile, the bipartisan Senate ethics panel is gearing up for possible hearings into Craig's case, a step requested by Republican leaders when they were trying to persuade the senator to step down.